The GTO rear cradle is isolated with two major bushings toward the front of the crossmember. These receive a good brunt of the rear suspension shock and have a tendency to move around quite a bit. As a result, the GTO is prone to wheelhop from cradle distortion. 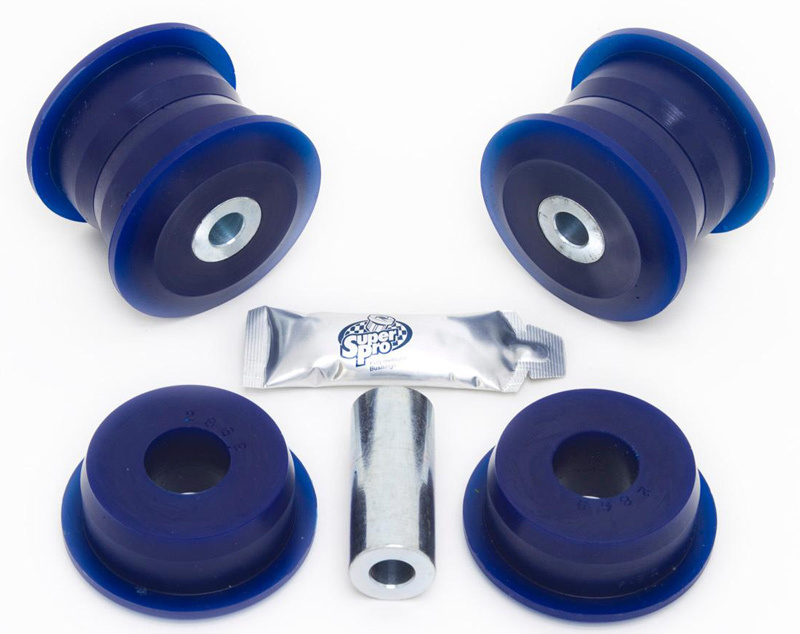 The SuperPro Rear Cradle Bushings are made from stiffer, more durable polyurethane that’s less susceptible to deformation under load. The GTO rear cradle is isolated with two major bushings toward the front of the crossmember. These receive a good brunt of the rear suspension shock and have a tendency to move around quite a bit. As a result, the GTO is prone to wheelhop from cradle distortion. The SuperPro Rear Cradle Bushings are made from stiffer, more durable polyurethane that’s less susceptible to deformation under load. It’s available in two flavors, street and race. The street is a balanced durometer that isn’t too hard or too soft while the race is stiffer and can be a little more harsh than its street sibling.